Two Canadian soldiers were killed in Afghanistan when their armoured vehicle hit an improvised explosive device, the military says. Two Canadian soldiers were killed in Afghanistan when their armoured vehicle hit an improvised explosive device, the military said Saturday. Master Cpl. Kristal Giesebrecht and Pte. Andrew Miller, both medics from CFB Petawawa, had been responding to a report of a mine found in the doorway of a home when their vehicle detonated the IED, the military said. The blast occurred about 20 kilometres southwest of the city of Kandahar. They were attached to the 1st Battalion, Royal Canadian Regiment Battle Group. A third soldier was taken to a hospital on Kandahar Airfield and was in stable condition. "Although we cannot say for certain that these medical personnel were targeted deliberately, it is for certain that the threat to Afghans stemming from the influence of out-of-area fighters at this time of year is very serious," said Brig.-Gen. Jonathan Vance, commander of Task Force Kandahar. "Medical technicians are indispensable to the work being done by Canadian and Afghan soldiers. They participate in every Canadian Forces patrol and operation," Vance said. In a statement Saturday evening, Prime Minister Stephen Harper offered his condolences to the families and friends of the two soldiers who "served bravely while helping to build a stable Afghanistan." "Our Canadian Forces members in Afghanistan daily face life-threatening situations that are created by an enemy who is working to undermine the building of a democratic and self-sustaining society," Harper said. "The courage and dedication demonstrated by Master Cpl. Kristal Giesebrecht and Pte. Andrew Miller speak volumes about their pride in Canada and in creating a better country for the Afghan people." Vance said Giesebrecht was born in Wallaceburg, Ont., and was a member of 1 Canadian Field Hospital, based at CFB Petawawa in the Ottawa Valley. He said she was married and a fit, dedicated and fun-loving medical technician serving her second tour in Afghanistan. "She was a mentor and an inspiration for her fellow medical technicians. Kristal loved life to the fullest. She was a wonderful friend, always opening her heart to everyone in need," Vance said. "Kristal prided herself on her health and fitness, although she always felt the solution to any problem could be found in a box of chocolates." Miller was born in Sudbury, Ont. A member of 2 Field Ambulance, based at CFB Petawawa, he was serving on his first overseas deployment. Vance said Miller will be remembered as someone who would give his fellow soldiers the shirt off his back and was always the first to volunteer. "Andrew was very confident in both his soldier and clinical skills. He wanted nothing more than to be part of the Health Services Unit for ROTO 9, in Afghanistan, so that he could put his skills to the test," he said. "Called Caillou by his friends, everyone acknowledged the resemblance [to the children's cartoon character] as soon as they met him." Trooper Karine Blais, 21, died last April when her vehicle struck an IED in the Shah Wali Kot district. In May 2006, Capt. Nicola Goddard died in a grenade attack in the Panjwaii district, west of the city of Kandahar. 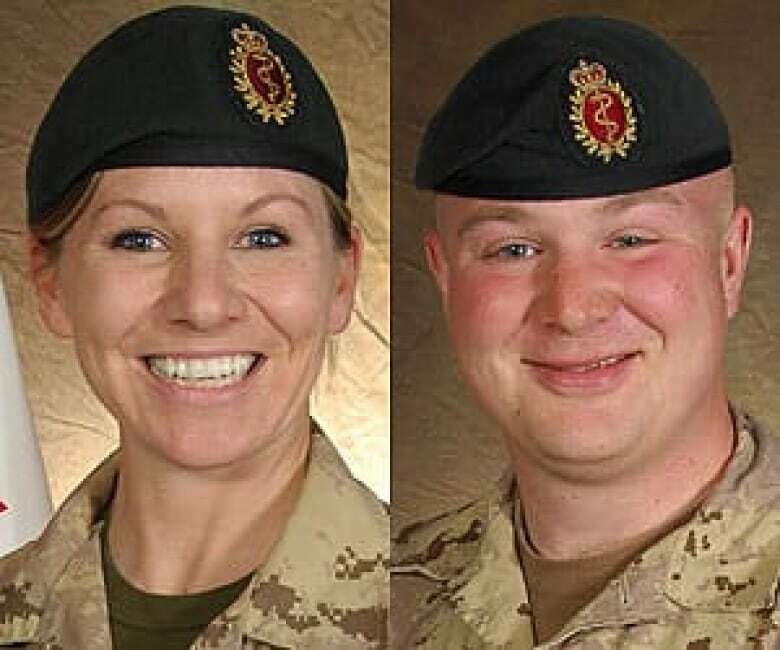 The deaths of Giesebrecht and Miller raise the toll in Afghanistan to 150 members of the Canadian Forces and four civilians. Sgt. James MacNeil of Glace Bay, N.S., was killed on June 21.